A portable solder fume extractor is a popular “maker” project…there are countless guides from Instructables, Make: and elsewhere. Most use two 9 Volt batteries and a voltage regulator inside an Altoids tin. In this tutorial we’ll update this classic project with current materials and processes: a lithium-polymer battery, USB charging and a perfectly-fit 3D-printed case. Placed close to your work, the fume extractor pulls away smoke when soldering. 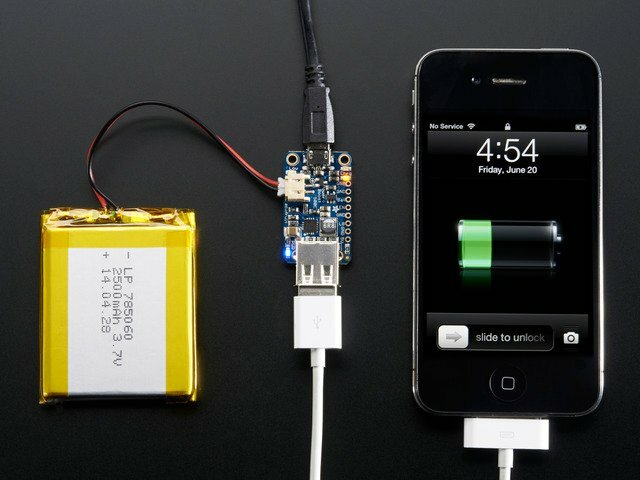 This makes a great companion to our USB Rechargeable Cordless Soldering Iron project. A single microUSB charging cable keeps all your portable electronics tools topped off! PowerBoost 500 Charger lithium-polymer boost converter. This project requires the 500 Charger specifically, not the 500 basic, nor the 1000 Charger. The case is specifically designed around this size. 500 mAh Lithium Polymer battery. Again, the project is very specific to this one size; no substitutions. 5 Volt DC fan, 50mm square x 10mm deep. 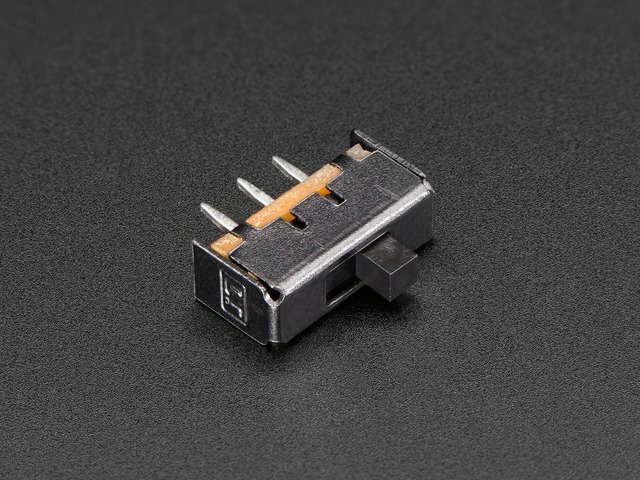 I used Digi-Key part #259-1576-ND (Sunon “MagLev” #ME50100V1-000U-A99). Not the cheapest fan, but this one provides a good balance between airflow (CFM) and static pressure (the fan’s ability to move air through filters or other obstructions). 2 (two) #4-40 x 1/2 inch pan head machine screws and matching nuts (M2.5 x 12 mm might also work). Activated carbon filter: smoke extractor refill such as Weller WSA350F or MCM Electronics #21-7961. Each sheet can be cut into 4 refills for our mini extractor. 3D printer, or use a service like Shapeways or 3Dhubs.com. You should have a 3D-printed case (3 pieces) and a working circuit and battery at this point. We’ll start with the back piece of the case. This is the slightly thicker of the two case halves. You should see four bumps that line up with the mounting holes of the fan. If there’s no bumps, you have the front piece…set that aside for now, start with the back. Line up the fan so the wires lead into the lower cavity. Check the fan’s airflow direction arrow, make sure it’s pointing front to back. We’re installing in the back of the case. The thin separator piece then installs atop the fan. This also has alignment bumps, which should face down against the fan. When everything’s pressed into place, it should fit flush with the raised screw holes just below it. Push the switch through the small opening on the side of the case. This will be a tight fit and you may need to press with a pen barrel or other tool. Once the switch lever is through the hole, the back of switch should then pivot down and click into place. The two-wires side of the switch is the “off” position…you can orient this either way as suits regional custom (e.g. shown here in the American “off=down” orientation). A notch in the case holes the fan-wires end (not the USB end) of the PowerBoost board, which then pivots down into place. There are some little bumps to temporarily hold the board, but no screws…the two halves of the case are carefully designed to hold each piece in position from all sides. The same notch-and-pivot motion holds the battery. It may be a little loose right now…that’s okay, the other half of the case will secure it…do not add any tape or glue. Using scissors or a straightedge and blade, cut a 50mm square piece from the filter foam. You can borrow the separator piece for a moment as a template. The foam then fits into the remaining void in the top case piece. The top and bottom halves press-fit together, with various protrusions on each side supporting components on the opposite side. This requires a little patience, as the fan and battery wires will get into places you don’t want them. If the case won’t close all the way, there may be a pinched wire. Open it up, nudge and bend wires as needed, and try again. If any of the protrusions break off during this step (especially the long narrow one supporting the switch), they can be glued back in place using 5-minute epoxy. Wait until its set firm before trying again. Once the case closes correctly, drop two #4-40 nuts into the hexagonal pits on the back of the case, then catch these with two #4-40 x 1/2 inch screws inserted from the front. A red LED means the battery is very low — below 3.2 Volts. The nice thing about lithium-polymer cells is that you can top them off any time, low battery or not. Plug in a USB microB cable to a phone- or tablet-charging wall supply, or a powered USB hub. You’ll see a yellow LED while charging, and a green LED when full. A full charge may take about an hour. You can use the fan while plugged into USB, but it may charge a little more slowly. With a full charge, the fan will run at least an hour, perhaps close to 90 minutes before the battery cuts out. This guide was first published on Feb 13, 2016. It was last updated on Feb 13, 2016.